Sola Salon Studios is excited to be opening its newest location in Omaha, conveniently situated adjacent to the Westroads Mall. Sola offers salon professionals high end studios located in one of the most desirable trade areas in Omaha. 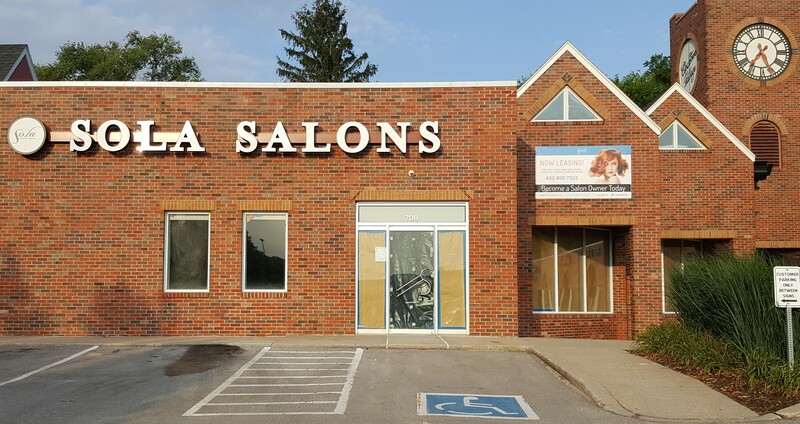 Sola Salon Studios (Sola), the premier location for established salon professionals, is pleased to announce commencement of construction on a new studio space in Omaha, NE at Clocktower Village across from the Westroads Mall. Scheduled for completion in October, the 5,500 sq.ft. salon includes space for twenty seven private studios in three sizes. The new studio is located at 709 N. 98th St. near I-680 and Dodge Rd. This will mark the second Sola location in the Omaha metro area. Sola set the standard for the salon suite concept with the opening their first studio in Colorado in 2004. The Sola model offers a compelling option for established artists who want to own a boutique salon without the traditional costs and risks. Today, more than 7,000 Sola stylists enjoy the freedom and benefits of salon ownership, customize their own fully-equipped studio, and set their own hours. In addition, they set their own pricing and receive full commission on retail products. Features of the new studios include private spaces with ample storage, oversized sliding/locking doors, floor-to-ceiling walls for privacy, individually controlled ventilation, all utilities, Wi-Fi, and full-spectrum lighting. The Clocktower Village build-out will feature a new studio layout and cabinetry design enhancements. Space leases are currently available. Pre-construction specials for interested salon professionals are available through September 30, 2016. For more information about leasing opportunities contact Kevin Kane at 402/800-7323, or kevin.kane(at)solasalons(dot)com. Sola Salon Studios was established in 2004 with the opening of the first-of-its-kind salon concept in Denver, Colorado. With over 285 locations today nationwide, Sola Salon Studios provides more than 7,000 salon professionals with premium, fully-equipped salon spaces to own and operate their individual boutique salons. Sola offers the freedom and benefits of salon ownership without the risks of owning a traditional salon. The innovative salon concept empowers experienced hairdressers, skincare professionals, nail techs, massage therapists and other like-minded artists to quickly and easily elevate their career. For more information, visit http://www.solasalonstudios.com. Follow us on Facebook/solasalons and Instagram@solasalons.